These are business cards for dog lovers. I can think of lots of ways that these cards could be useful. 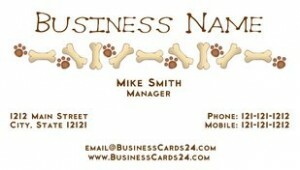 The best part: it’s super simple to design your own high-quality, professional dog business cards yourself! There are lots of dog business card designs to choose from — each featuring paw prints, a specific breed, dog bones, and more. You can use one of those exact designs to create your own business cards, or start with one of those and then modify it in order to create your own unique look. 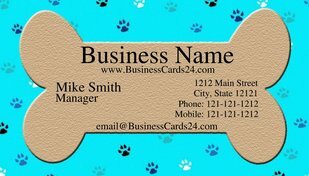 It’s quick and easy to design your own dog business cards in minutes. 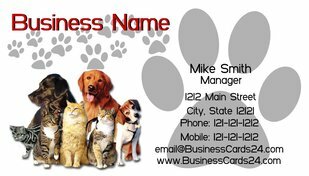 Whether your business is dog-related or you just want to show your fondness for dogs, these dog business cards fit the bill. Got a dog website? Why not share it with the people you meet by handing out a fun business card with your site’s URL on it? Own a pet sitting business? Leave a few of these dog business cards behind and offer a discount for referrals. Want to walk others’ dogs? Let people know by posting a few of your dog business cards on neighborhood bulletin boards. Are you a photographer who likes to photographs pets? Spread the word with some dog business cards. Veterinarians and groomers use dog business cards for appointment reminders. These business cards can be customized any way you want. The Online Design Tool is simple to use. You just click on the line of text or area of the card that you want to edit and change the words, size, or shape of the object any way you want. You can design both the front and back of your business card. You can even put a photo of your dog or your own custom logo on them — whatever you want! …all with the exact same look and design as your dog business cards! Prices start at $16.95 for 100 business cards (two-sided). 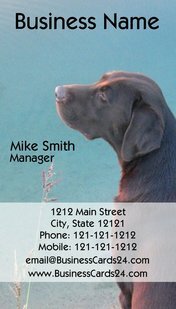 I’m most impressed by the variety of dog business card templates you can choose from — all with their own unique placement of dog-related graphics and symbols. This makes it easy to create a professional looking business card — that’s uniquely yours — in minutes. I was invited to review these dog business cards. This is a paid (albeit honest) review of business cards for dog owners.